Moore’s Law perhaps should have been Moore’s Theory or, even more carefully, Moore’s Hypothesis. Just to refresh our memory, what Gordon Moore initially said, in 1965, was that the number of components on a chip would double every year. This has been revised a little, and it is now generally accepted that we are looking at doubling at around every 18 months to two years. When Moore formulated the law, there were no microprocessors, but it is frequently cited as a measure of the way that processing power increases. Over the last few years, there have been research programmes, driven by the semiconductor vendors, either directly or indirectly, to develop the manufacturing hardware and technologies that allow the fabs to continue to shrink feature sizes, and sometimes these programmes are called “More Moore”. This definition includes technologies generally known as MEMS (micro-electromechanical system) technology and nanotechnology. I find it interesting to look at the early stages of things, so it was with great joy that I discovered that this field was first described by a hero of mine, Richard Feynmann. Fifty years ago this month (or in December 1959 if you are reading this in the archive) he gave a lecture at Caltech called There’s Plenty of Room at the Bottom. In this lecture he looked first at building chemical elements one atom at a time (something not yet achieved – although single atom mechanical manipulation has taken place) and then, as an alternative, scaling tools down to create smaller tools, which in turn would make smaller tools, and so on until the tools could operate at the molecular level. MEMS technology uses IC processing technology, with some extensions, to create mechanical and electromechanical systems. A classic MEMS device is a sensor, such as a pressure sensor, which also has some CMOS circuitry for conditioning the signal and passing it on in an appropriate form. MEMS is also used, reportedly, for the accelerometers within the iPhone, to sense changes in orientation or, when the unit is shaken, to change apps. Wii is, of course, accelerometer based. When the dimensions of the features involved in these systems go below 100 nanometres, then you are in nanotechnology territory. 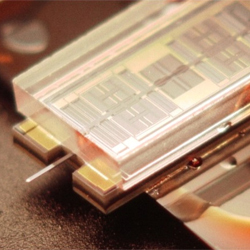 Here again, today’s IC fabrication techniques have a role to play, supported by techniques such as ion beam etching and writing. In the early days of the discussions of nanotechnology, the suggestion was that tiny “submarines” could be injected into patients to move in the bloodstream to specific parts of the body to deliver medical treatment. Fantastic Voyage was a movie (with Raquel Welch and some actors) that involved shrinking humans into a submarine and sending them through the bloodstream of a man with a blood clot on his brain. The actuator combines a large range (±50µm) with sufficient force (±195µN) to position for example in-vivo brain electrodes. This has to be the first time that I have seen ±50µm as a large range, but to be able to place electrodes very precisely into the living brain is quite something. Since it burns under 100nW at 11V, it has a long battery life. The actuator is sealed in a watertight encapsulation, and hydrophobic surface treatment also stops water getting in. But the fun thing is that it has six “arms” — small actuators that can move the whole package until it reaches the point where it has to place the electrode. Not a full-blown submarine, and no room for Raquel Welch, no matter how miniaturized, but clearly opening new doors to diagnosis and treatment. Today, the control circuitry for controlling the package is fabricated separately and conventionally, then attached by wire-bond, but research at IMEC into TSV (through silicon via) technology suggests that this will make possible monolithic units, fabricated on a single piece of silicon. The Nano Group at the University of Southampton is using the new clean room, launched in September this year, to explore NEMS (nano electromechanical systems). An initial project is exploring options for high-speed, non-volatile, and low-power memory, which will provide instant power-up for computers and mobile devices. They are also looking at integrating NEMS with conventional electronic devices to create advanced switch, memory, and sensor devices, and they will be working on quantum information devices based on single-electron and single-spin device technology. The hope is that, by combining well-controlled silicon nanostructures NEMS, nanophotonics, and nanospintronics, they will be able to improve the performance of information-processing devices much earlier than would be possible by merely increasing integration along the Moore’s Law curve. One area of concern for the cynical observer is the way that governments and government-backed organizations appear to be embracing the possibilities of nanotechnology and More than Moore. In Europe there is now the ENIAC programme, a Joint Technology Initiative, with a theoretical budget of €3 billion (US $4.8 billion) between 2008 and 2017. Some of this is cash from the European Community and member states (European national governments), but the bulk is “In Kind” from the private sector companies that make up AENEAS, the ENIAC Industrial Association, which sets the strategy. AENEAS was founded by ASML, Infineon, NXP, Robert Bosch, STMicroelectronics, SOITEC, and Thales and Thomson, and it now has over 50 members. The UK, which always maintains a semi-detached view of European initiatives, is currently carrying out consultation. In the US, the National Nanotechnology Initiative (NNI) program has been coordinating Federal nanotechnology research and development since 2001. And NIST (National Institute of Science and Technology) is working on More than Moore in the technology and metrology needed to support the integration of microcircuits, microfluidic devices, micro-sensors, and micro-actuators; on the technology and metrology needed to enable a Smart Petri Dish; and on applying microfluidic and nanofluidic devices to the formation, characterization, and separation of nanoparticles. This is necessarily a short overview. Despite my reservations about too many government initiatives, the inner nerd rejoices in the combination of pushing hard against the boundaries of electronics and the extension of related tools to create these fascinating small machines. If I were younger, I would assess More than Moore as a well-cool technology.